This is my last TMNT cover for a while (though there is a chance I'll do some more of them for IDW down the road). The scheduling was such that this cover was not shown in previews because I couldn't get the artwork done in time for the solicitation deadline, but I was able to schedule it in before the publication deadline. And for a long time, I was told the subject of this micro-series 1 shot was to be kept under wraps (I think everyone assumed it would be Shredder...and this was a surprise) but the cat is out of the bag now, and I can share the process of this cover. 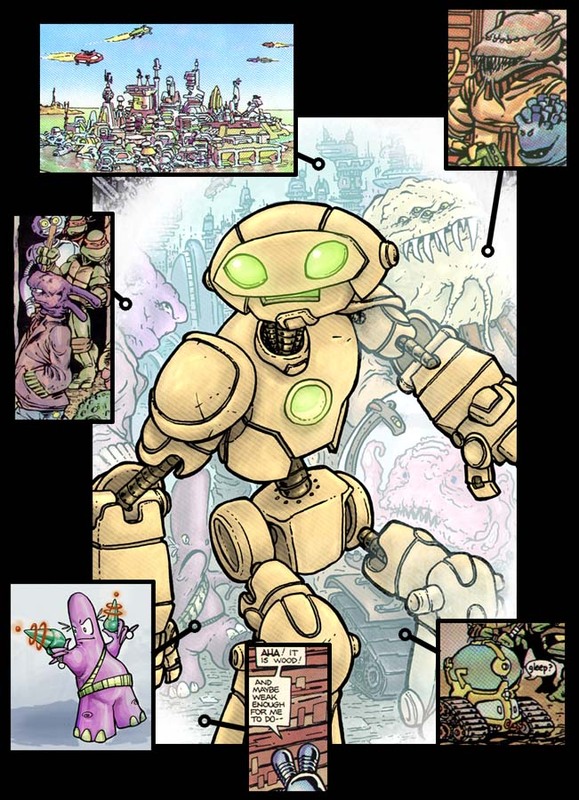 Everything IDW (comic publisher) approves has to also then go through Nickelodeon (TMNT rights owners). Nick thought the cover was a mis-direct to the audience. 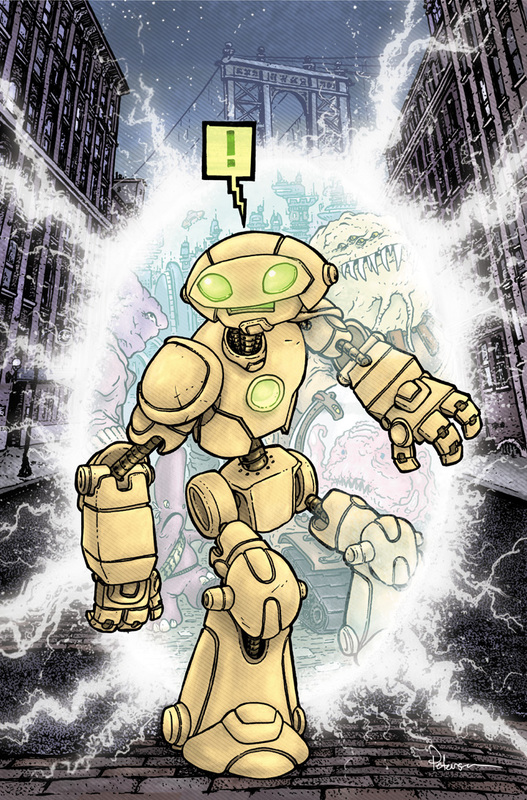 In this issue, Fugitoid isn't hiding out on the alien planet, he comes to earth to lay low. So, they wanted a redrawn cover with a Manhattan background. 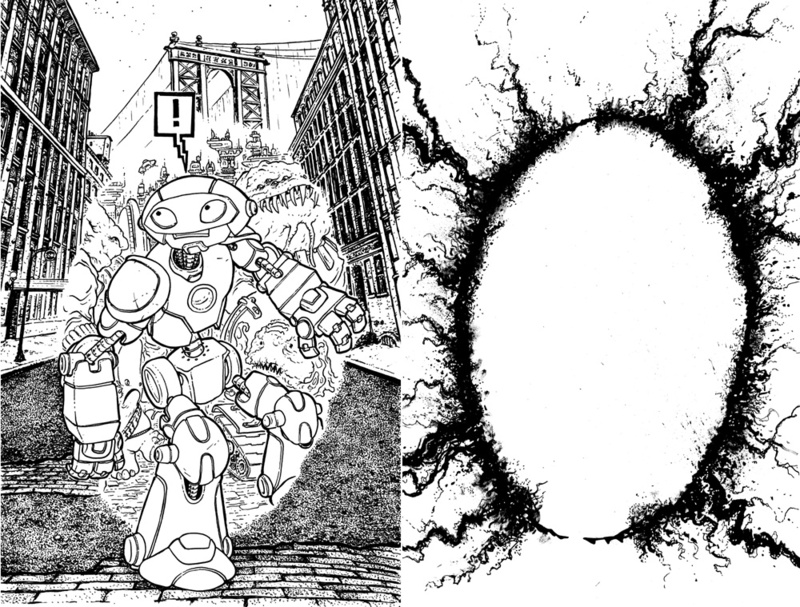 Knowing I was short on time for a redrawn cover, IDW editor Bobby Curnow suggested a salvage job on the layout with Fugitoid stepping through a portal and into New York. I loved the idea and reworked the layout trying to keep as much of my alien planet background as I could while showing a street that clearly was New York (with the Manhattan Bridge in the background). Once Nick approved the layout, with a few small change requests, I printed out my layout, and used a lightbox so I could ink the cover on bristol using the printed layout as a guide underneath. 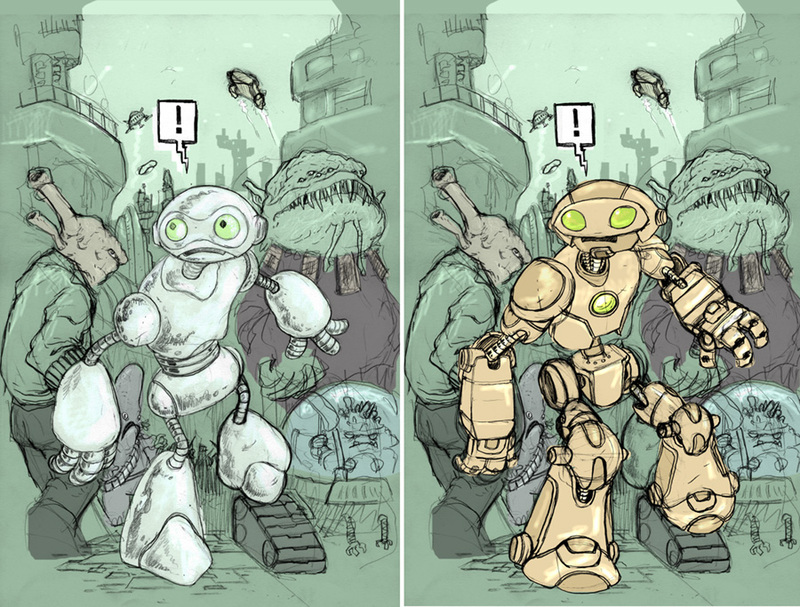 One of the changes Nick asked for was to add either a Stone Soldier or Utrom as one of the background aliens. You will notice I altered the tank-tred-car's pilot in the lower right to be a Utrom. To get the portal effect, I inked the portal's edge on a separate sheet of paper. I used a brush (wet & dry) and a pen to get some fine lines and stipples. Doing the effect artwork on an overlay sheet makes it easier to isolate it in the coloring process. 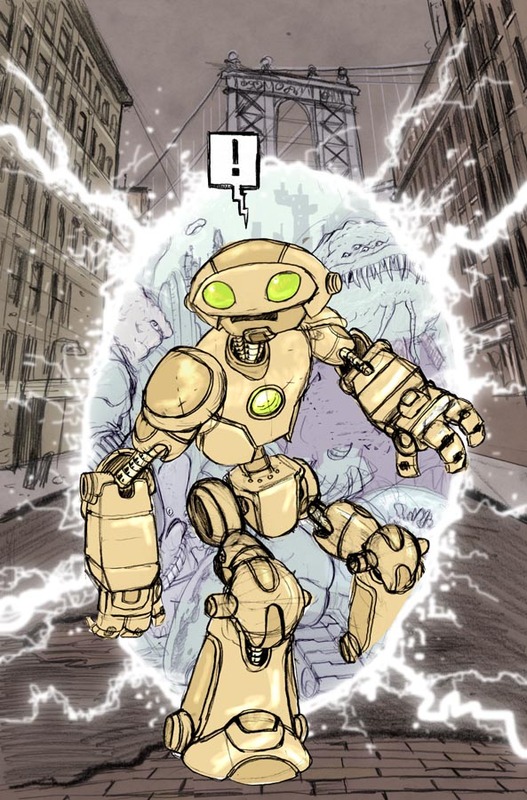 Final colors: It took a while to get the right balance of light/dark, foreground & background push pull, and Fugitoid's leg to look like it was still coming through the portal, but with a good audio book and a night to yourself, you get there in the end. The color choices centered around Fugitoid being in the yellow/orange family, so I wanted to make the background violets & blues as a complimentary contrast to keep him as a focal point amid two complicated backgrounds and a cross-dimensional rift. I have two version of the portal effect layer going here. Both have been inverted so the inkwork is displaying white, but one is blurred out so the effect glows and isn't too crisp and clean looking. I put in a lot of personal details on this cover. 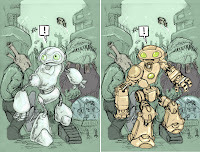 As a big fan of the Eastman & Laird run, I referenced their issues with Fugitoid. I looked to the shapes they made for the skyline of the alien planet, I added a few aliens from their panels (top left & right). The tank-tred-car started as something of theirs, but I thought it needed a pilot, which then became my place to sneak in a Utrom. 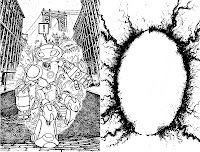 Even the ground of the alien planet is based on the texture pattern of the alien-wood fence that Fugitoid & the TMNTs find themselves up against when they meet (I always liked how simply that pattern did the job of making the material understandable & foreign at the same time). As a personal touch, I hid a redesigned version of a race (drawn here by me) created by my friend Mike Davis back when we were in high school. Here are last week's Watercolor Wednesday pieces and better look at the pieces in case you missed them. First up was this version of Frankenstein's Monster. 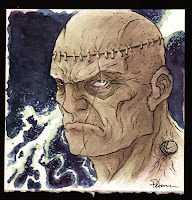 I've drawn the Monster several times and I keep coming back to pretty much this design of him: bald, neck bolts, stapled brain cavity access scars, face sewn in places (perhaps from multiple donation subjects) This time I played up some dark bruising under the eyes like one would tend to have after having surgery on the head or face. 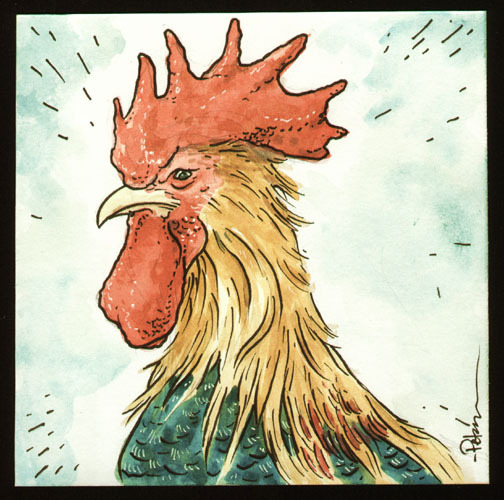 The second is a rooster...because I felt like painting a roster with bright colors. 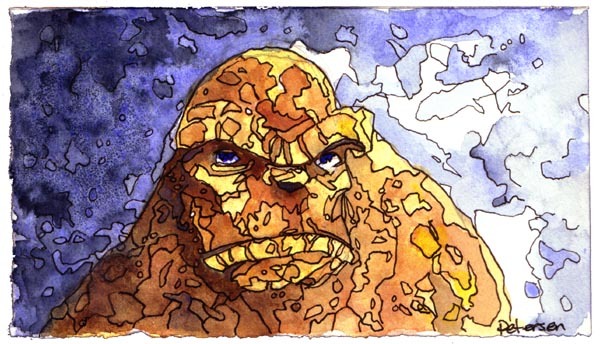 And third is an older piece (from 2004-ish) of The Thing. This was the style of watercolor I was doing where I'd outline the color splotches after I painted a loose painting. You can see more of that type of work of mine here. Tomorrow I'll post a new original watercolor piece in my online store and I'll tweet and Facebook update when the new art is available. I've been drawing a Mouse-related comic just recently and have received feedback about how it reminds people of Mouse Guard, and Redwall, I thought I'd check out what people are talking about and thereby came upon your site and now, your blog. Just wanted to say a great big wow. Love your work! needless to say I'll be buying the books so I can dive into your world properly!